TV dinners are frozen trays of pre-cooked food. Also known as frozen dinners, they are assembled automatically on a conveyor system. In this process, the food is initially prepared and cooked. It is then placed on the trays and rapidly frozen. The concept of a frozen dinner was first made popular in the 1950s. With the increased use of microwave cooking, frozen dinners have become a large part of the grocery market. They generate over $4.5 billion in sales each year and that number continues to grow. The development of the TV dinner traces its history back to the origin of the technology for freezing food for later use. The practice of freezing food has been known for centuries. No doubt, this technology was discovered accidently by people living in cold climates such as the Arctic. However, it was not until the nineteenth century that any real commercial use of frozen food technology was known. The earliest commercial attempts at producing frozen food were centered on meats. One of the first patents related to freezing food was issued to H. Benjamin in 1842. Later in 1861, a U.S. patent was issued to Enoch Piper for a method of freezing fish. The incidence of frozen food became much more widespread later in the century with the advent of mechanical refrigerators. In 1861, the first meat freezing plant was established in Sydney, Australia. One of the first successful shipments of frozen meats occurred in 1869. Success in the frozen beef market prompted food manufacturers to develop freezing methods for other food types. One method was the "cold-pack" process that was used around 1905. This early technology was based on a process called slow freezing. In this method, food was processed and then put into large containers. The containers were put in low-temperature storage rooms and allowed to stay there until frozen solid. This could take anywhere from one to three days. Unfortunately, this technique had two significant drawbacks. First, for some products like vegetables, freezing was too slow. The vegetable's center would start to spoil before it was frozen. Second, during freezing large ice crystals would be produced throughout the food. This lead to a break down in the food structure, and when it was thawed, the taste and appearance became undesirable. Clarence Birdseye improved on this process when he developed a quick-freezing method. During the early 1900s, Birdseye worked for the U.S. government as a naturalist. Stationed in the Arctic, he had the opportunity to see how native Americans preserved their food during the winter. They used a combination of ice, low temperatures, and wind to instantly and thoroughly freeze fish. When this fish was thawed, it looked and tasted as good as if it were fresh. Birdseye returned from the Arctic and adapted this technology for commercial use. By using his method, Birdseye was able to reduce the time it took to freeze food from three days to a few minutes. He perfected the method and in 1924 began the Birdseye Seafoods company. The product was a success and he turned his attention to methods for freezing different types of foods. In 1930, after years of development, he patented a flash-freezing system that packed meat, fish or vegetables in waxed-cardboard containers. He helped get these products in the grocery stores by codeveloping refrigerated grocery display cases in 1934. Since freezers were not widely available to consumers, this product did not succeed immediately. However, in 1945 airlines began to serve frozen meals. In the early 1950s freezer technology had advanced to the point that people could afford to have them in their houses. This led to the introduction of TV dinners in 1954. Since this time, they have been a convenient alternative to homemade meals. TV dinners represent a unique adaptation of frozen food technology. Most foods will spoil over time depending on storage conditions. This degradation is the result of natural chemical reactions and microbial growth. People discovered that food could be made to last longer was by freezing it. When food is frozen, the food-spoiling chemical reactions like oxidation by enzymes are slowed. Also, the growth of microorganisms such as bacteria and mold is stopped because these organisms cannot flourish in the cold temperatures. Since the process does not kill all microorganisms, those that survive a reactivated when the food is thawed. While frozen foods resemble fresh food more closely than food preserved by other techniques, they do undergo some changes. The freezing process causes ice crystals to form throughout the product. These crystals cause a certain amount of degradation in texture and taste by disrupting the cell structure of the food. This problem was significantly reduced by the development of the quick-freezing method which produced much smaller ice crystals. Not all foods are suitable to be frozen, particularly vegetables. For example, of the thousands of different types of peas that are available, only a few varieties produce a good tasting frozen product. A large amount of research has been done to determine exactly the types of food that are usable. It has been found that most meats, fish, and poultry can be frozen. However, certain meats and fish that are high in fat content tend to breakdown slowly even when frozen. This limits the shelf life. TV dinners are popular for a variety of reasons such as convenience, quality, and ease of preparation. One of the greatest appeal of frozen dinners is that they are so easy to prepare. In fact, people who are not good cooks can enjoy nearly any type of dinner they want. Typically, all that is necessary is for them to heat up the product in the oven or microwave. These products require little preparation. Today, there are thousands of different types of frozen dinner products on the market, and more products are being introduced each day. The earliest TV dinners included a meat product, potatoes and a vegetable and a dessert. This has been expanded to include pasta dinners, oriental dinners, ethnic and specialty plate dinners. There are also special dinners for people who are watching their weight. The types of food sold in TV dinners has become quite varied. Different types of meats include beef, chicken, turkey, and even sausage. Any number of vegetable dishes can include peas, corn, broccoli, and cauliflower. Mashed, whipped, and baked potatoes can be included. Pasta dishes, such as lasagne, spaghetti, linguini, or fettuccini, can make up the whole TV dinner. Typically, desserts like apple strudel or cranberry sauce are also included. A distinguishing characteristic of a TV dinner is the partitioned plate container in which it is sold. The first TV dinners used aluminum trays covered with cardboard. While they are still used, these types of trays have given way to plastic and paper trays which are more compatible with the microwave. The food is arranged in the different compartments to keep everything separate. Dinners that are designed for home consumption are generally sold in sizes ranging from 10 oz to 1 lb (0.28 - 0.45 kg). Preparation can be done either in a microwave or conventional oven. The disadvantage to microwave cooking is that the meats do not get the baked texture. Everything tends to be a bit soggy. However, ovens take much longer to cook than microwaves. The primary raw materials used in the production of TV dinners are the food ingredients. 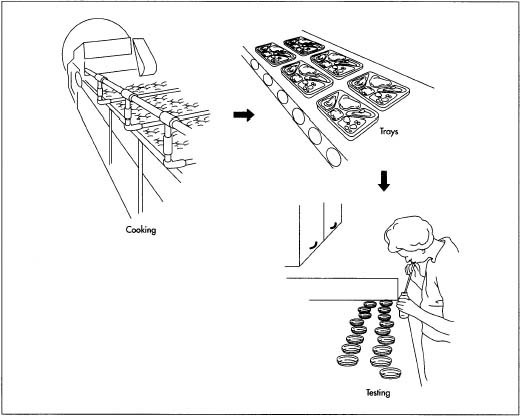 A unique adaptation of frozen food technology, the process for producing TV dinners is highly automated and can can be broken down into three stages. First the food is processed and prepared. Next, it is loaded into the packaging and then frozen. To ensure good quality TV dinners, only high quality food is used. Depending on the variety of the TV dinner, this generally includes meats, potatoes, vegetables, fruits, or pasta. Since tv dinners are prepared foods other ingredients are also needed. This includes such materials as flour, water, and eggs. Flavoring ingredients such as salt, sugar, onion powder, pepper and various spices help improve taste. Artificial colorants are used to improve appearance. A preservative like sodium benzoate is also added to maintain quality during storage. Since TV dinners are a frozen product, it is imperative that the raw materials are available at the appropriate time. For certain manufacturers, harvesting is scheduled to take place at the same time so the maximum amount of food raw materials can be utilized in the minimum amount of time. Most frozen vegetables and fruits are prepared and frozen within four hours after harvesting. For making the cartons, various materials such as aluminum, cardboard, paperboard, and plastic is used. These are typically provided prefabricated to the TV dinner manufacturer. They are made by typical molding processes. The carton also contains the printed labels and directions. This is also typically done by contract manufacturers and shipped to the TV dinner maker. For health and safety reasons, the government sets strict guidelines for minimum food quality. Raw ingredients are checked to make sure characteristics such as pH, odor, taste, moisture content, and appearance are within accepted standards. While the food is processed, it is tasted and analyzed to make sure the ingredients are put in at the proper proportions. and prepared. Next, it is loaded into the packaging and then frozen. 1 The first step in the process involves the processing of the incoming food. Depending on the type of food, this will mean different things. For vegetables and fruits, they are placed on a movable conveyor belt and washed. They are then put into a container and steamed or boiled for one to three minutes. This process, known as blanching, helps destroy enzymes in the food that can cause the chemical changes that negatively affect flavor and color. Before meats can be cooked, they are trimmed of fat and cut into appropriate sizes. Fish is cleaned, scaled and cut into fillets. Poultry is thoroughly washed and dressed. 2 Next, the different food dishes are prepared in large quantities. Meat is flavored, seasoned, and put on trays. It is then cooked in an oven for a predetermined amount of time. Vegetables may be further steamed or boiled, and mixed with flavoring ingredients. Potatoes are typically whipped in large, stainless steel containers. Other ingredients called for in the recipe are added and then they are cooked. When this step is complete, all of the food is cooked and ready to be packaged. It is then sent to the filling lines. 3 Trays are put at the beginning of the filling line and the conveyor system is started. As the trays pass under various filling machines, food is placed in the compartments. The amount of food placed on the tray is strictly regulated by the filling devices. This ensures that every TV dinner gets exactly the same amount of food. 4 After a tray is completely filled with food, it next moves to the packaging station. Here, dinners are covered with either aluminum foil, paper or some other topping. The food is packed tightly and a partial vacuum is created to ensure that the container is airtight and no evaporation takes place. Evaporation can have a variety of negative effects. For example, it can cause food to dry out. It can also allow package ice to form which can result in freezer burn giving food a dull, dried-out appearance. 5 From the tray loading station the dinners are moved to the freezing units. Today, most manufacturers use one of three rapid freezing methods: cold air blast, direct liquid immersion and indirect contact with refrigerated plates. For TV dinners, the cold air blast method is most often used. In this freezing technique, the trays are carried into a freeze tunnel and passed through a series of refrigerated coils. Fans inside the freeze tunnel blow cold air around the trays. Since the temperature can get as low as -75° F (-59° C) the dinners freeze instantly. 6 As the dinners exit the freezers, they are stacked and put into cardboard cases. These cases are put onto pallets and placed in a refrigerated storage facility. They are then transported in a refrigerated truck and stored in the grocers freezer. Good quality food that is prepared properly and frozen will remain in nearly perfect condition if it is kept at 0° F (-18° C) during shipping and storage. In the United States, quality control is a highly regulated and important aspect of every food processing facility. For health and safety reasons the government sets strict guidelines for minimum food quality. Meat is particularly well regulated because there can represent a significant health risk if poor quality meat is used. Quality control begins with the receipt of raw materials. They are checked to make sure characteristics such as pH, odor, taste, moisture content and appearance are within accepted standards. Next, the processing equipment is sterilized and checked for microorganisms before manufacture begins. While the food is processed, it is tasted and analyzed to make sure the ingredients are put in at the proper proportions. 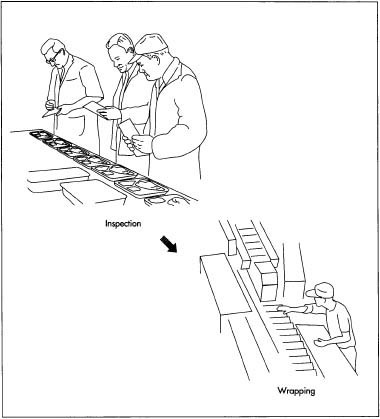 During the filling process, quality control workers are stationed at various points of the production line. At the filling section, they ensure that each compartment is filled correctly. At the end of the filling line, workers watch to make sure that each tray is set before it is covered. Future improvements in TV dinner manufacture will focus on improving quality, speeding production, and increasing sales. A recent development has been the application of cryogenic freezing methods. This is a super fast freezing method that has allowed the utilization of foods that had previously been unsuitable for freezing. This method is also thought to produce a better tasting product. In addition to new freezing methods, new packaging materials will be used. Manufacturers are constantly trying to solve the problems associated with microwave heating. They have introduced special trays that give meat a baked texture. There may also be trays that allow some components to be heated while other remain cool. Bald, W.B. and A. Robards, ed. Food Freezing Today and Tomorrow. New York: Springer-Verlag, 1991. Erickson, M. and Y. Hung. Quality in Frozen Food. New York: Chapman and Hall, 1997. Mallett, C.P. Frozen Food Technology. New York: Routledge, 1993. Your article was great. I am a great cook and I thought about my own businees in producing tv dinners so thanx for the article.